Launched in 1980, the advertising series for the Swedish-made, French-owned Absolut vodka brand is the world’s longest running ad campaign, yielding over 1500 variations based, simply, on the distinctive shape of its bottle. 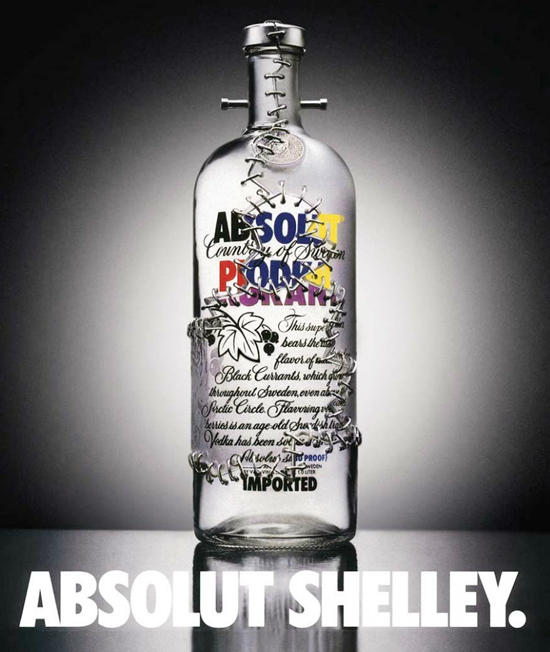 The Absolut Shelley Frankenstein bottle and the Absolut Karloff ad were both created by the campaign’s original photographer, Steve Bronstein, who would produce some 200 ads for the campaign. From a pre-computer era, these are actual photographed props. Among other genre references, an Absolut Wells ad shows an invisible bottle (! ), and the Absolut Transylvania ad features a mountaintop castle with a bottle-shaped turret. 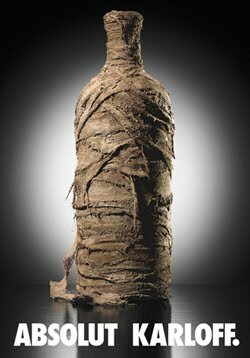 A fabulous gallery of Absolut ads. As a lifelong Universal Monsters fan, I am tickled silly by those ads. Thank you for sharing!